Labor Day 2011 Bastrop State Park and surrounding area had a catastrophic wild fire that affected 34,000 acres and destroyed 1697 homes. I can’t speak for the people who lost homes and businesses from the fire, but the natural landscape is healing very well. While visiting the park, I made several of my own observations on tree regeneration and got some good information while on a walk with the park host. One of my first observations and question was why are all the tall pine trunks killed by the fire still standing. Why weren’t they removed? The first answer that initially came to mind was the funding for such a removal project would be immense. The subject came up on a guided tour with the park guide, and the answer was the new vegetation both planted and natural regrowth took better in areas where the old trunks remained. An analogy would be it takes a village to raised a child and it takes an ecosystem to raise a tree. 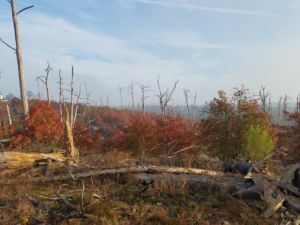 The burned trees were a valuable part of the ecosystem and the foundation for a successful tree regeneration program. The softwood provided homes for owls and other birds. The rotting wood provided food for termites and which provided food for other insects and small vertebrates, mammals, reptiles and birds. The rotted trunk material returns its nutrients to the soil. The old ushers in the new. New Pine Growth on the North Face of a slope is evidence of tree regeneration. Fortunately, there were no heavy rains in 2011 after the fire. Heavy rain after the fire would have caused bad erosion when the soil was vulnerable. Without stable ground and fertile soil, plants cannot take root. Erosion has occurred in the park, but hydro mulching and manually reseeding trees mitigate erosion. 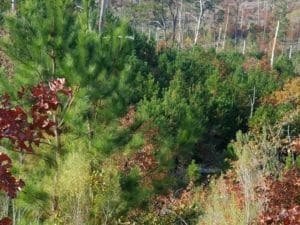 For a good twist of fate, there was a blanket of seeds for the strain of loblolly pin unique to Bastrop that had been slated for disposal that was still available for replanting. 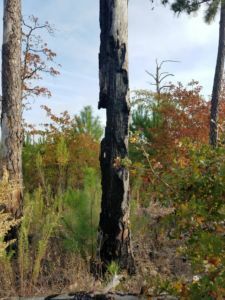 Fire opens many other pine species seeds but fire destroys loblolly seeds. Native grasses were flourishing. I visited the park six years after the fire that became known as the Bastrop County Complex fire that ignited September 4, 2011 and was the most destructive wildfire in state history. I didn’t see that initial stages of the park’s healing process. The park guides spoke of a white-footed mouse they observed in the initial recovery stages that blanketed the landscape. The mice arrived to take advantage of the pioneer plants with large nutritious seed pods and the temporary absence of predators. The resurgence of pioneer plants and a large population of white-footed mice brought back the indigenous predators, highlighting the close relationship between wildlife and tree regeneration. The dominant tree species are the loblolly pines, then post oaks, and black jack oaks. The dominant Chaparral tree is the Youpon Holly. This tree is extremely flammable. There are also still some pioneer tree species around such sand willows and a pinate leaf tree and with a bean pod similar to a mesquite. The oaks are naturally more hardy than the pines in direct sunlight. They are growing multi-trunk bushes back all over the park. The oaks will never reach the size or height of the single trunk trees they are replacing. The oaks could dominate the short-term future of the Bastrop forest. They are replacing the single-trunk trees on slopes where the sun is intense. In places where the Texas son is less intense like the north-facing slopes and the lowest part of the steep valleys, the loblollies and other more delicate plants are flourishing. Trained arborists are overseeing the changes. A good recovery will not necessarily mean a return to the exact ecosystem of the past. “That is impossible,” Kelly said. Tree Regeneration at Bastrop State Park Oaks on South-Facing Slope. Oaks returning.